It may well be a mistake to write a blog piece just a few minutes of witnessing the most lamentable and shambolic hour of Cricket, in England by an England team, since probably the dark days of the 1990's. But I'll have a go. 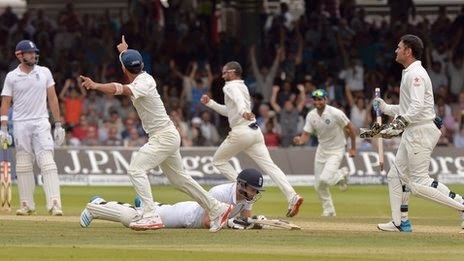 Don't get me wrong, overall India were the far better team and fully deserved their first away Test match win for 16 matches and their first actual victory at Lords since 1986. They bowled well, batted even better and showed patience and guile after losing a very important toss. They deserve the win, simple as that. Capt Dhoni: Right lads, I've got a fab plan. We're going to use some tactics that the English won't expect, in fact, they literally won't see it coming. Random Indian player: We're going to use spin, right? Capt Dhoni: Nope - not with the Burnley Lara coming in at number 11 with his reverse sweep malarkey. I've got something else in mind. Random Indian player: Ooh ooh ooh I know, we're going to bowl a nice tidy length outside off stump and let them just prod it about until the new ball. Then use spin. Capt Dhoni: No we're not going to bloody well use spin!! We're going to set a trap for them with my plan. Random Indian player: Oh fab! - Is it a cunning plan? Capt Dhoni: No, its going to be bloody-well obvious-in-your-face plan. 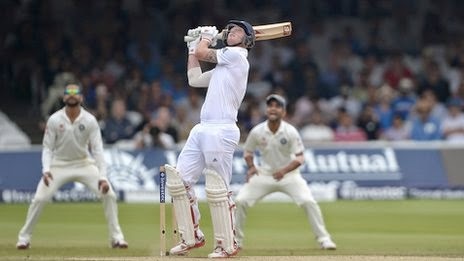 The thing is though, the English batsmen are a bit thick so they'll fall for it no bother. Random Indian player: C'mon boss - tell us the plan. Capt Dhoni: We're going to bounce them out. We'll set out fields with men out in obvious catching positions and the England lot will fall for it. After all, I saw that Johnson chappie make them cry in the Ashes and now everybody knows that the England boys don't like it up em. Random Indian player: Funny one boss, but you've forgotten a couple of things. We're playing in England, they know the playing conditions and we don't have a brilliant fast bowler like the Aussies......no offence Ishant, mate. We know that the England players a bit thick, but not that much. Capt Dhoni: No, I'm deadly serious. 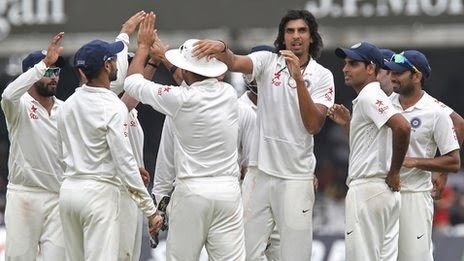 Ishant is going to bowl fast and maybe even get the odd one on target (more giggles erupt). The English will think that they have to get all the 146 runs to win in the few overs that they have before the new ball is taken. They'll think that once the new ball is taken Ishant will really go to town on them.....especially if he gets the odd one out of six on target. (Again more giggles, Sharma sadly nods his head in agreement). Random Indian player: But won't they realise that Ishant will be a bit knackered by the time the new ball comes and actually all they have to do is just be sensible and be just play intelligently? Losing is bad enough, but losing when good situations before and during the match have been squandered, reducing the Indians at one point to 145 for 7 on a lush green day one pitch, is simply not good enough. The final morning's magnificent work by Root and Ali should have provided the foundation for a patient, intelligent attack in the afternoon - not a Hail Mary charge up the beaches at Normandy. 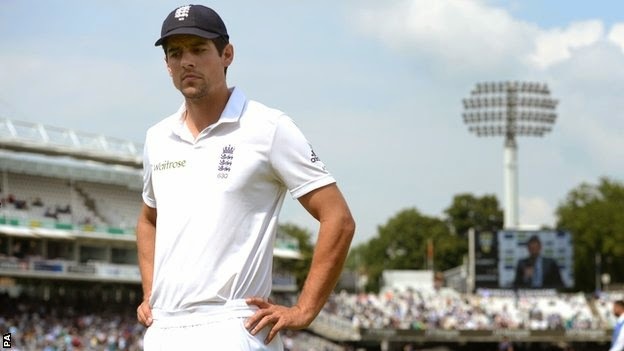 I have been a long time supporter of Alistair Cook as captain - but questions will now be asked more than ever about not only whether he is fit to lead but whether his batting is fundamentally, possibly terminally, damaged as a consequence. An average of 14.33 in the last five Tests and captaining his side in what is now 10 winless matches tells its own story. Previous England Captains have been sacked for less. I apologise to my Indian friends if it doesn't appear that I've given their side enough credit for the win. Maybe I should have waited until tomorrow, or better still, another 10 years before writing this.